I'm so glad you all take the time out of your busy lives to come visit and link up each week! I think we all benefit when we share with one another and I'm so glad to have the opportunity to host this exchange! Last week's fan favorite was posted by Liz Marie Blog (again...she's very popular with you all!) 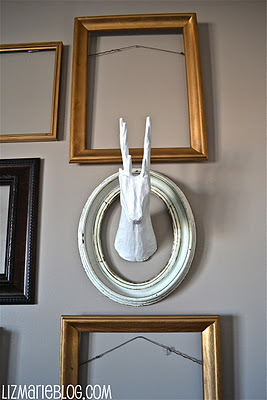 She shared her DIY deer head sculpture...I LOVE this idea!! 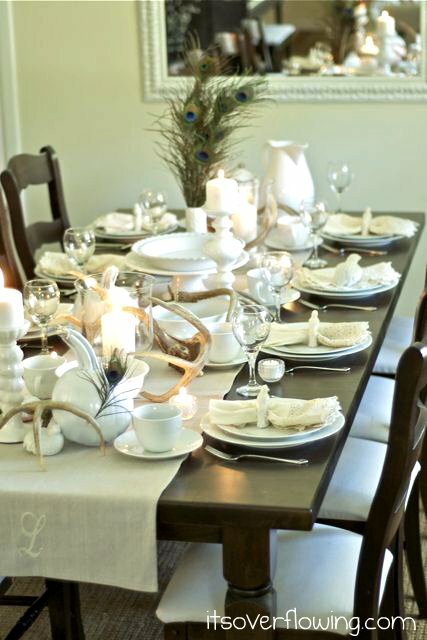 First up, It's Overflowing shared her lovely Thanksgiving Tablescape. I adore the addition of the antlers, and I'm in looove with the peacock feathers. A Step in the Journey shared her striped powder room. So pretty! Finally, while we're on the subject of bathrooms, Living Beautifully DIY shared her be.au.ti.ful master bath reno. I could live in that bathtub, it's so pretty! Truly a job well done. I just did a little happy dance.. umm, well maybe it was a big happy dance, but who is judging? haha I love my little deer head, I'm so happy that he was a fan favorite!! Made my whole day :) I hope that you are having a great week!! Thanks again. Thank you for hosting! I haven't linked up in forever so I thought I'd join the fun this week. Love the highlighted links from last week! Wow! Thanks for hosting - I love the projects you featured...the bathtub looks spectacular and I love the chandelier over it. I don't see the link up to join. Oooo!!! What a great way to start the day :o) Thanks so much for featuring my powder bathroom makeover. Linked up last night and things were looking great...all links are gone this morning. Uh Oh! Can't find the Link either??? I love the striped powder room, too. I pinned it, and have talked my husband into doing it in our house. There we go...we're all back. Thanks for hosting! Love your party every week! Hi, Wendy. Your design features are gorgeous. I shared a Pennsylvania Dutch hog maw recipe and a candied sweet potatoes recipe today. Thank you for hosting us again and have a great week! Those bathroom makeovers are just gorgeous, good picks! Happy Thanksgiving, thanks for hosting. Look again, i think those are peacock feathers, not ostrich, lol. Love visiting! Happy Thanksgiving to you and yours! Hope all are happy and healthy! Hi, Wendy. I shared a holiday cranberry salad recipe today. Thank you for hosting us again and Happy Thanksgiving!